During the morning of Tuesday, Sept. 9, the SPEs were observed in outburst producing many more meteors than usual. 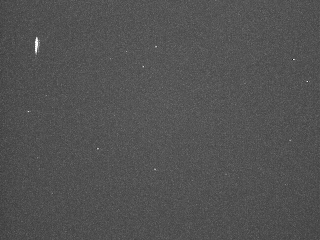 My automated sky camera was able to detect over a dozen bright meteors, each one as bright or brighter than the brightest stars in the sky. One meteor was even brighter than Venus and was easily the brightest thing in the sky though for no more than a second. An image of this meteor can be seen above. There are few stars visible in the frame because the camera can only see stars down to magnitude +2. The triangle of faint stars near the beginning (left end of the meteor trail) is the west end of the constellation of Cassiopeia. A few other examples of bright meteors can be seen below. 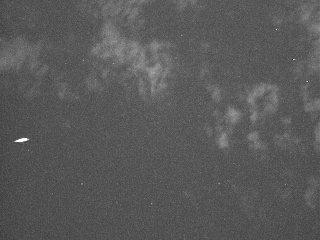 SPE seen over Tucson at 1:01 MST. SPE seen over Tucson through clouds at 1:30 MST. Yet another SPE at 2:45 MST. The radiant is the point in the sky that the meteors appear to travel, or radiate, from. Meteor showers are named after the constellation that contains their radiant. In the case of the September Perseids, the meteors radiate from the constellation of Perseus. The September in the name not only tells us what month the shower is visible but differentiates it from the more famous Perseids of August. Plot of the radiant of the 2008 September Perseids. 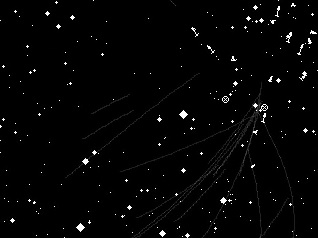 The plot to the right shows the paths of all the detected meteors as bright white arrows with the following shape (|—>). The light gray lines are the extrapolated paths of the meteors back towards their point of origin. The meteor paths are plotted on a star chart and all of the white dots and diamonds are stars. The two symbols denoted by a circle with an X in it are two previously suggested radiants for the September Perseids. From the large number of meteor paths intersecting nearby, it is obvious that the proposed radiant in western Perseus is closer to, though not exactly at, the observed radiant from last night. My data shows the radiant at (RA = 49° and Dec = +39°). Even though SEPs should have been observable between 8:00 pm and 5:00 am MST (3:00-12:00 UT), they were only observed between 12:30 and 4:15 am. This suggests the outburst was relatively short and lasted for only a few hours. Over the next few nights, a few more SPEs may be observable but at a much lower rate than last night’s outburst. A suite of software written by Sirko Molau called MetRec was used to automatically detect meteors and determine their radiant. 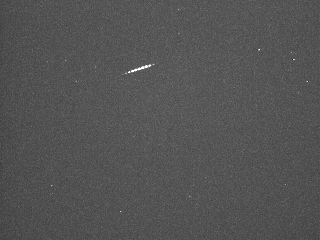 Other observations of the September Perseids can be found at the excellent Spaceweather.com website. I’m glad the two of you found this blog so useful. I will try to keep everyone up to date on other meteor showers as well as interesting comets and asteroids. I live in Missouri and I saw a very bright meteor on september 9th (My birthday) between 8 and 9 p.m. that night. It looked so awsome. I was looking at the stars and the next thing I know this unexpected ball of fire shoots across the sky. will i be able to see this event this year?